Russian sculptor; born in 1866, in the government of Kovno. He was the son of a poor schoolmaster ("melammed"). He studied first at the Wilna School of Design, then at the Academy of Fine Arts in Warsaw, and finally at Paris, where he was a pupil of Antokolski (1890-1896). 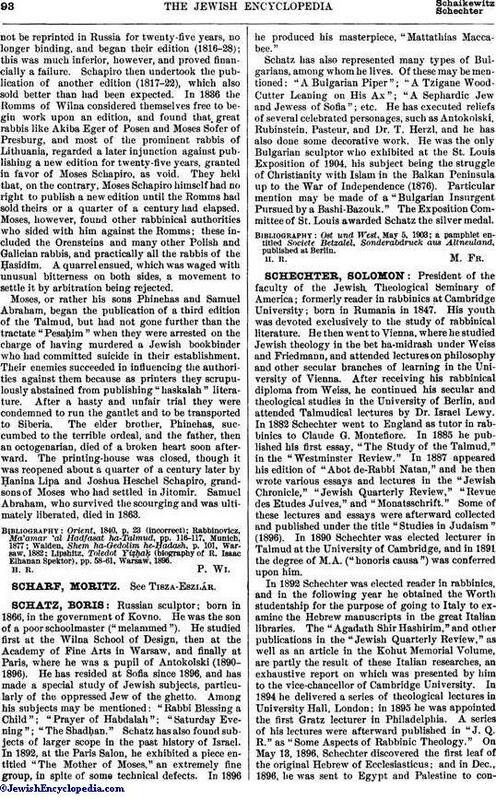 He has resided at Sofia since 1896, and has made a special study of Jewish subjects, particularly of the oppressed Jew of the ghetto. Among his subjects may be mentioned: "Rabbi Blessing a Child"; "Prayer of Habdalah"; "Saturday Evening"; "The Shadḥan." Schatz has also found subjects of larger scope in the past history of Israel. In 1892, at the Paris Salon, he exhibited a piece entitled "The Mother of Moses," an extremely fine group, in spite of some technical defects. In 1896 he produced his masterpiece, "Mattathias Maccabee." Schatz has also represented many types of Bulgarians, among whom he lives. Of these may be mentioned: "A Bulgarian Piper"; "A Tzigane Wood-Cutter Leaning on His Ax"; "A Sephardic Jew and Jewess of Sofia"; etc. He has executed reliefs of several celebrated personages, such as Antokolski, Rubinstein, Pasteur, and Dr. T. Herzl, and he has also done some decorative work. He was the only Bulgarian sculptor who exhibited at the St. Louis Exposition of 1904, his subject being the struggle of Christianity with Islam in the Balkan Peninsula up to the War of Independence (1876). Particular mention may be made of a "Bulgarian Insurgent Pursued by a Bashi-Bazouk." The Exposition Committee of St. Louis awarded Schatz the silver medal. a pamphlet entitled Societe Betzalel, Sonderabdruck aus Altneuland, published at Berlin.